As computers and the Internet continue to play an ever-increasing role within any corporation — it’s not surprising to see employee development systems evolving and being utilized at a similar pace. Managers faced with the task of setting up or streamlining an existing training initiative during these lean times are more than aware of the costs associated with instructor-led or off site training. The bottom line dictates that it’s simply not a viable option for a company to send hundreds of learners through such a routine. With the advancements of Learning Management Systems, it has never been easier for managers to plan, design, deliver, administer, and report a company-wide training initiative; for both in-house and off line modalities. A company of any size needs to incorporate a blended learning campaign into their work schedule in order to grow and prosper and eLearning is by far the most cost effective method available. All that’s required to get your eLearning endeavor off the ground is a small investment consisting of; a computer with internet access, a Learning Management System (LMS), course content, and a commitment to delivering structured training to your company’s most valuable asset…its workforce. In order to optimize your web-based training, be aware of what kind of environment you’re providing your employees with. Setup an appropriate number of computers — obviously dependant on the size and scope of your company’s training needs — in an area or room that’s a good distance away from loud production areas and provide high-quality headphones in need be. By giving the users a formal yet comfortable environment, they’re more likely to excel in a “self-paced” mode of training. You’ll have to do your homework to find an LMS provider that fits your needs. Some providers will supply you with only the skeleton of a training system and you’ll be required to create or insert all of the course content. Other providers will offer a wide array of training topics — ranging from production and maintenance practices to lean manufacturing and health and safety — and you can pick and choose the content that your employees will benefit from. Another factor you should be address is the ability and ease of adding company-specific information and materials. As stated previously, the efforts and time associated with this step this will depend on which training provider you end up going with. There are providers out there that will actually come to your facility, help you create a detailed plan that caters to your operations and training needs, and will conduct initial and follow up “train the trainer” sessions as well. Others may request an employee spreadsheet and some existing training materials and will take care of these tasks for you, so ask questions and know how much assistance you are going to receive when choosing your eLearning provider. Depending of the size of the workforce that’s being trained, you may need to appoint multiple facilitators. The different facilitators can have varied roles and administrative access to ensure that training schedules are created upheld. Facilitator tasks are actually rather simple and include; adding new users, adding groups, enrolling users into groups, creating curricula, adding custom course content, assigning groups to curricula, as well as tracking and reporting. A common misconception that dooms any employee development system is that ‘structured training should be reserved for new employees’. Although eLearning is an excellent way to deliver or reinforce information for recently hired individuals to get them up to speed, it’s the ideal training tool for level-setting the knowledge base of all groups of personnel. Wouldn’t you agree that if you hire and hold onto good employees — it makes sense to invest in the development of their skills to increase their productivity and efficiency? An LMS of any kind should have capability of enrolling users into appropriate groups based on outlined criteria — such as location, job position, department, shift and knowledge base. Each defined group is then assigned to a predetermined curriculum stemming from your company’s structured training plan. A given curriculum can consist of a handful of interactive courses as well as existing, or newly created, company-specific PowerPoint presentations or documentation, or even on-the-floor exercises conducted with a manager that can implemented into progress reports. Your team, and perhaps your training provider, should make a conscious effort to find course content that applies directly to all of the different skill levels and positions that exist at your production facility. Be sure to list out exactly what is crucial to your operation when creating and implementing a training plan. The training facilitator can easily adjust assignments to keep the training as relevant as possible and to update employees’ assignments as they change positions or locations. This is an excellent strategy for keeping everyone on the same page as job requirements are constantly being adjusted, especially when dealing with multiple locations. Obviously, with 24/7 availability, you can train your workforce whenever time permits. It’s common for companies to create an eLearning schedule that dedicates one to two hours per week for a formal, self-based mode of training. New hires should have a more rigorous computer-based agenda to get up to speed, but their retention of facts and practices should be verified on the floor as their training takes place. Use downtime as a positive (or to at least to offset what’s going on!). When it does occur, think of it as an opportunity to get some of your non-essential employees into the training room. Also be sure to document all procedures — whether their preventative or urgent — so that any information learned can be utilized to streamline what takes place in the production area. All defects that may occur within a given process should be explained, both visually and theoretically, to guard against material being wasted and your customers receiving unacceptable parts. When a new job is setup at your place, go ahead and create a custom training course that covers everything an employee would need to know to ensure that productivity and quality are being upheld. This course can be as simple as a brief PowerPoint presentation or a two-page document and can be as detailed as several video clips showing suggested procedures to setup, troubleshoot or maintain a consistent and repeatable application. The training provider that you ultimately choose should have these options outlined for you so that any amount of information can be conveyed to your workforce in the shortest amount of time — thus utilizing minimal resources. The content of any training program that is delivered to your employees should be verified to make sure that the course information corresponds with your facility’s practices. During this review, it is ideal to note where inserting custom, company-specific content is either beneficial or necessary. Keeping the training content as updated and relevant as possible will increase the effectiveness of the entire employee development system. Don’t let this scare you — by inserting simple media like photos, documentation, or audio clips can make a huge difference and won’t take up much time at all. If you have the resources, then use a combination of video, photos, and diagrams to create custom sections that can be inserted into existing courses. It’s imperative to verify that information learned via the computer-based training transcends to the production areas. It is highly recommended to reinforce any mode of training with on-the-floor training. There are plastics training providers that will supply you with supplemental task sheets and additional materials to be used for that exact purpose. Each task sheet corresponds with a particular course, or series of courses, and can be customized to provide a given job position with step-by-step instructions for common production, maintenance, or quality-related procedures. Before launching a formal training initiative, a plastics manufacturer must gather metrics so that improvements can be monitored. You’ll need to quantify the following areas within your facility; scrap rates, mold repair costs, machine repair costs, product rework costs and the amount of regrind counted as inventory. These costs should be posted in the plant, and as monetary values when possible, so that all employees can see the current status of where money is being lost. Additionally, machine utilization percentages, customer returns, machine downtime, and number of accidents should be reported as well. After a structured training plan is implemented, be sure to post regular updates that highlight improvements in all of the aforementioned areas. It’s a fact that all successful and profitable operations treat training as a continuous component of employee development and have the figures to prove it. It is critical to get support, from top management down, to make certain that an effective training plan is in place and that it is being carried out appropriately — or your eLearning initiative will fall short in yielding the most lucrative results. A training initiative can be used to; carry out a company’s mission statement, state education goals, bring new hires up to speed, develop the skills of established employees, prepare personnel for certification tests, and streamline efficiency. Training providers should meet your company’s specific needs and should be involved during both the setup and monitoring phases of your eLearning endeavor. It's time to upgrade your training approach with Routsis - the premier training provider for the plastics industry. Hands-on, online and ongoing, Routsis Training's RightStart™ program combines the best attributes of traditional one-to-one plastics training with a powerful, dedicated online portal that's accessible anywhere. Click here for a word from Andy Routsis, founder and president. Routsis has the ideal solution for you. Continuous, convenient, practical programs for the skills your organization needs to succeed. Our effective, accessible courses help plastics professionals advance their careers. Our comprehensive array of online plastics courses cover a broad range of topics and skill levels. 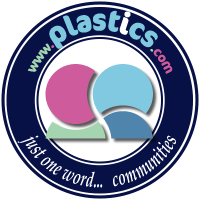 Get maximum flexibility with your company's own dedicated online plastics training portal. Our exclusive online training packages deliver essential training to you or your employees. We offer online plastics courses in Spanish, Portuguese, Mandarin, and Bahasa Malaysia. Hands-on training to help your compay imrpove efficiency, profitability, and competitive position. Perform the same type of labs found in expensive seminars at your own pace, in your own facility. Our exclusive training implementation process kick-starts your mission-critical training. Click here for free preview videos of our online plastics training programs. Our handy pocket reference is now available on Android™ devices. Need an answer quickly? Check out our Frequently Asked Questions page. Click here for resolutions to the most common technical support issues. 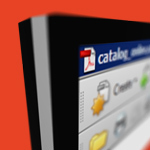 Click here to download the latest catalog of our plastics training products. For more information about our partnerships with plastics industry and educational leaders, click here. Looking for free training demonstrations? Click here to fill in our request form. It’s time to upgrade your training approach with Routsis – the premier training provider for the plastics industry. Hands-on, online and ongoing, Routsis Training’s RightStart™ program combines the best attributes of traditional one-to-one plastics training with a powerful, dedicated online portal that’s accessible anytime. 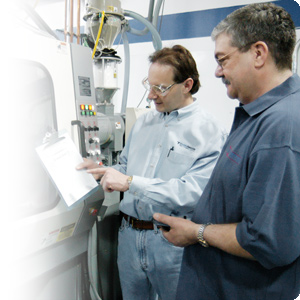 The Routsis SmartTech™ program is the most effective hands-on training program for plastic processors and technicians. This unique combination of face-to-face, on-line, and hands-on skill development focuses on the science of injection molding – not just on the workings of a particular injection molding machine.